Cavanagh turns the tables in this nail-biting legal thriller that hides a serial killer on the jury and sets the clock ticking. 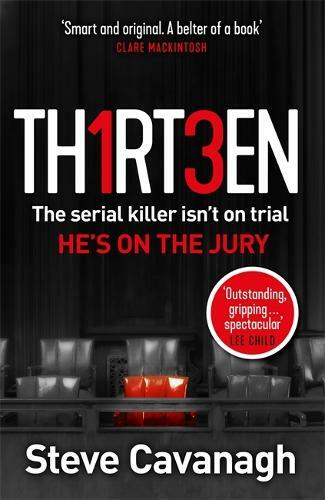 Offering an original twist on the courtroom thriller from the author of The Defence. He's on the jury... .
Joshua Kane has been preparing for this moment his whole life. He's done it before. But this is the big one. This is the murder trial of the century. And Kane has killed to get the best seat in the house. But there's someone on his tail, ex-conman turned trial attorney Eddie Flynn and he alone suspects that the killer isn't the man on trial. For Kane, time is running out - all he needs is to get to the conviction without being discovered and for Eddie, it's a race against time to get to the killer before the wrong man takes the fall. If you love reading fantatic fiction books, then come along to our fiction bookclub! May's Fiction Book Club pick is 'Thirteen' by Steve Cavanagh which in 2018 was voted Ireland's 'Crime Fiction Book of the Year'! It's a fast paced, original thriller filled with twists and turns which according to Michael Connelly is 'ingenious'. As always all are welcome, so join us of the 16th of May at 6.30pm to discuss this 'belter of a book'. Refreshments will be provided. I was expecting a John Grisham style courtroom drama. What I found when reading this novel exceeded all expectations : the characters are legion, the plot twists are clever and frequent and the story is gripping. What an extremely thrilling, highly original, fast-paced and exhilarating read.